When it comes to children and the Internet, most parents focus on safe Web browsing. That's understandable, given that the Web can sometimes seem like one big Red Light District. But the Web isn't the only source of objectionable material online. E-mail can be just as bad. Surely, you say, there must be a simple way to let kids exchange messages with family members and friends while protecting them from online predators, crude spam, phishing messages, and the like. In other words, if there's a NetNanny, there must be a "MailNanny" too, right? Well, not really. But this quick guide will help you pick the most age-appropriate e-mail setup and give you tips to keep the deluge of online indecency from reaching your little ones. Anybody familiar with Gmail knows that it does a pretty good job of blocking spam and viruses, so why not just create a new account for your teen or tween? You could, but Gmail's browser-based interface isn't exactly kid-friendly. Plus, it offers no parental controls, such as the highly desirable option of creating an approved-senders list (grandma, yes; chunkylover53@aol.com, no). Some creative Boolean filtering might do the trick, but who has the time (or degree in computer science) for all that? As a busy parent, I certainly don't have that kind of time, which is why I'm test-driving three other options: AOL, Windows Live Mail, and a service called ZooBuh. Each lets you set up individual accounts for your kids and helps enforce various usage restrictions, such as who they can e-mail and who can e-mail them. Here's what you need to know about all three. 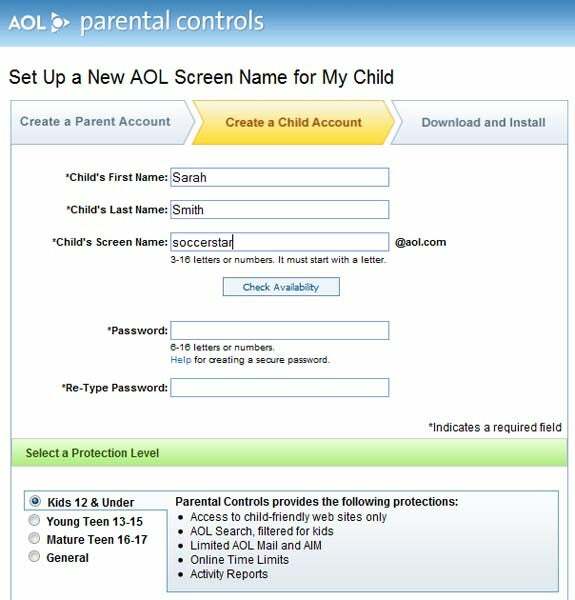 Cross AOL's longstanding free e-mail service with a child-oriented Web portal, and what do you get? KOL, which offers not only games, music, movies, and other stuff aimed at teens and tweens, but also free e-mail accounts with robust parental controls. Because AOL has been around for so long and has so many users, finding an available screen name for your child can pose a challenge. To take advantage of them, you'll first need an AOL account of your own. If you don't already have one, head to AOL.com, click Free Mail, and follow the instructions. From there, visit AOL Parental Controls and click the appropriate age group--Kid, Teen, or Mature Teen--for your child. Next, click Create Account, and then fill out the form requesting your child's name, desired screen name, and password. AOL has several bazillion screen names already in use, so you'll have to choose something unusual or nonsensical--always a good idea anyway, as a child's screen name shouldn't contain any personal information. As for the password, make it something easy for your child to remember, but still robust enough to thwart hackers. For example, insert numbers between the letters of your child's name, as in "s1a2r3a4h5". Once you've completed the sign-up process, you'll have to download and install AOL's Windows-only Parental Controls software. With that step done, return to the Parental Controls Web site, where you'll see a green Settings area for your accounts. Click the Edit button next to your child's account, and then scroll down to the E-mail Controls box and click Edit E-mail Settings. 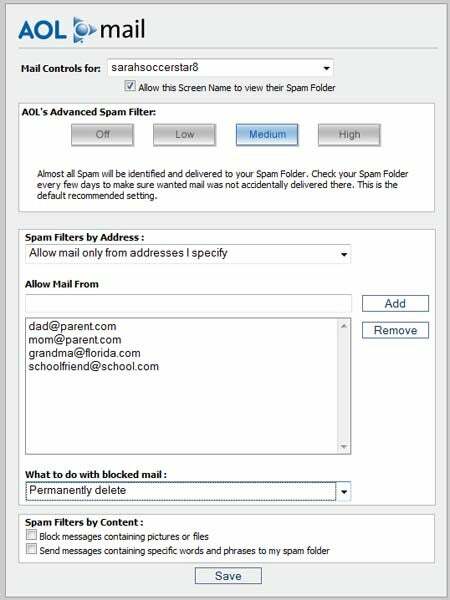 AOL offers custom spam filters that can block e-mail from all addresses except those you approve. By default KOL allows mail from all senders to come through to your child's account, but you can set up a filter to allow only known senders--arguably the better approach for younger kids. In the 'Spam Filters by Address' menu, choose Allow mail only from addresses I specify. Next, type the address of each person who is allowed to e-mail your child (school friends, family members), clicking Add after each one. If your little one receives a message from someone not on the list, the server will automatically delete it or route it to the Spam folder, depending on which option you select. Note that AOL also lets you block any mail containing pictures or files. Unfortunately, AOL doesn't give you a way to block outbound e-mail. But it does give you control over instant messaging, chat rooms, and downloads, and even lets you set up connection-time limits and retrieve activity reports. Not bad, given the price tag: It's all free. When you're done with setup, head to the KOL site and show your son or daughter how to sign in, check and send e-mail, add contacts, and so on. It's an uncluttered, easy-to-use environment, one that kids should take to in no time. And it offers the peace of mind that comes from knowing that your child's inbox will remain free of unsuitable stuff.